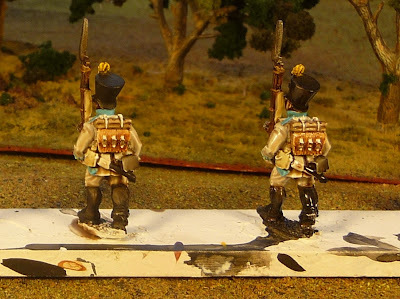 I know I said I was doing Prussians next, but I have been considering how I am going to paint white. I do not believe I am patient enough to use something like the Andrea white system. The other day I came across some Army Painter, so I said why not. I finally figured out how to set the white balance on my camera so I am reposting my photos, these photos are not retouched. These 9 Front Rank Austrians were painted in well less than 2 hours, which I believe to be a pretty good clip. Forgot to paint the buttons yellow in first photo. Army Painter Quickshade Strong Tone. This is actually quite dry. Testor's Dullcote. Really takes the shine off. With (left) and without Dullcote. I like what I see, but I may test the the Quickshade Soft Tone. I apologise to those who put some comments on the earlier post, but those photos just had to go. 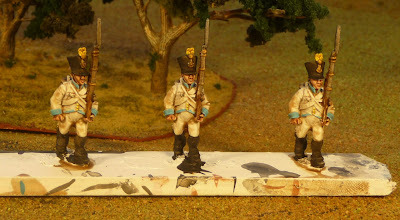 That is very impressive,far better than trying to hand shade/line in my opinion, really works well on the Austrians. Very impressive - I would have never thought to use the strong tone on white uniforms. Did you paint it on or use the dip method? 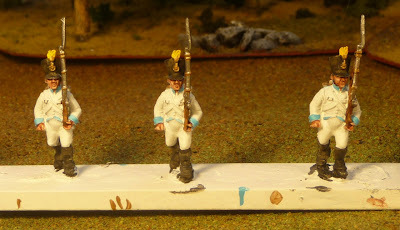 I am hoping to whip up an Austrian force pretty quickly with this method. The photos really do not do them justice. I used a brush, as I can control the amount much better. Coming along nicely.........how did you lose to Iannick? Was Leto the military genius? I was not aware that my defeat to the Archiduc was common knowledge!! I can not blame Leto as he appeared to have been locked up stairs. It was a great game, and I was a little timid with my horse and cannon. (First game with an actual opponent in 35 years may have played a part). I will look forward to a rematch. By the way your painting is great as is Iannick's. I am sure he cheated as he is a no good fat-cat lover. I am pleased you had fun and like the figures. When Iannick agrees to pay my airfare I will bring my collection over and we can have a classic battle!